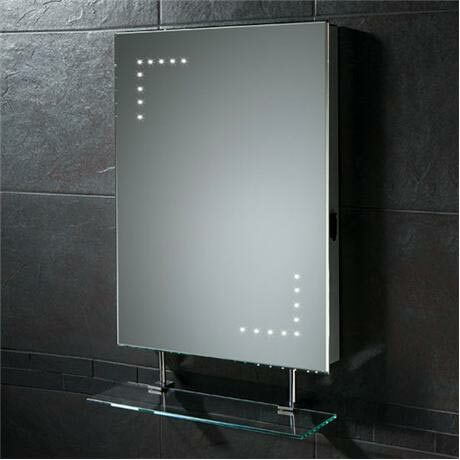 This Modern Celeste LED Mirror is part of the Lighting/shaving range from HIB. The Celeste is portrait mirror with glass shelf and featuring LED lighting, Heated Pad, Shaving socket and a sensor function. This stylish modern mirror uses cutting edge technology and would be a stunning feature in any modern bathroom. Q. Is the total length of this mirror 600mm including the shelf. If not is the shelf and it's supports removable. Hi, the dimensions of the mirror are H600mm x W450mm x D70mm. This does not include the glass shelf, it would be 680 mm in height including the shelf and supports. However these can be removed if required. Thanks! Quality mirror bought to replace a similar item which I had accidentally cracked. I was even able to use the existing screw holes as they were exactly the same distance apart! Parcel arrived very soon quickly after it was ordered and was extremely well packaged. All in all very good service.